Please give at least 48 hr advance notice. Please mention any dietary restrictions. We are delighted to serve locally produced wine from Whitecliff Vineyards with Dinner. We use only the finest seasonal fruits, produce and meats sourced from local farms and wineries. And our water is filtered four-ways-to-Sunday with 4 whole house filters as well as 4-stage reverse osmosis filter on the drinking water. Come and manga tutto! Don’t feel like getting in the car to go out for dinner? Then let us serve you a romantic Meal for Two in front of a panoramic view at Spa B&B. 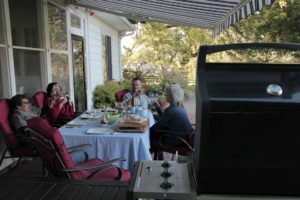 These meals, served ‘al fresco’ weather permitting, with wine, under our canopy, are not open to the public and are exclusively for our B and B guests. Share this extra special breakfast as you both relax with a bottle of Prosecco. Choose from any of our breakfast offerings and with it have a complimentary bottle of Prosecco. All Potatoes cooked in organic coconut oil. All breakfasts come with fruit cup, coffee, tea and orange juice. Our most popular! Picture fresh eggs and farm fresh sautéed veggies with melted cheese in a bed of fresh potatoes, cooked to perfection in a skillet using organic coconut oil. All breakfasts come with fruit cup, coffee, tea and orange juice. If you lived on the East Cost you may have never had Huevo Ranchero like this: Eggs the way you like with fresh sautéed vegetables on a bed of tortillas and refried black beans, topped with cheese and baked in the oven… comes with salsa and sour cream. All breakfasts come with fruit cup, coffee, tea and orange juice. For a Gluten Free option have eggs the way you like with a side of homemade potatoes cooked in organic coconut oil and choice of uncured Bacon/Ham with farm fresh salad in season. All breakfasts come with fruit cup, coffee, tea and orange juice. Thick French Toast with organic Maple Syrup, Along with a fried egg and bacon. All breakfasts come with fruit cup, coffee, tea and orange juice. One of Dan’s favorites… It’s the ultimate Monte Cristo…! Thick French Toast with organic Maple Syrup, stuffed with Turkey and Sharp Cheddar along with a fried egg. All breakfasts come with fruit cup, coffee, tea and orange juice. Our most popular… can be Gluten Free! with complimentary bottle of wine: 4 courses. There is nothing more romantic than an Italian meal especially when it is cooked by a real Italian. Start with a seasonal crudite appetizer. Then mixed green salad with tomato, sunflower seeds and goat cheese. Have one of our pastas with Grandma’s sauce, made with love from scratch with farm picked organic tomatoes and vegetables and cooked for 5 hours. Finish with tea or espresso and imported dark chocolates. with complimentary bottle of wine: 4 courses. First start with a seasonal crudite appetizer, Then mixed green salad with tomato, sunflower seeds and goat cheese. , This salmon dinner, features a ginger soy lemon marinade and cooked on the grill. Comes with rice and farm picked seasonal vegetables. Finish with tea or espresso and imported dark chocolates. with complimentary bottle of wine:4 courses. Nobody makes Chicken Breast better! First start with a seasonal crudite appetizer. Next a mixed green salad with tomato, sunflower seeds and goat cheese.. Then delve into an Organic Chicken breast, marinated in lemon-garlic and cooked on the grill, that is so juicy you will never forget it. Comes with grilled potatoes or rice and farm picked seasonal vegetables. Finish with tea or espresso and imported dark chocolates. complimentary bottle of wine: 3 courses. First start with a seasonal crudite appetizer. Tasty chicken meatballs seasoned with Asian spices along with sautéed greens, garlic, ginger, with raw shredded beats and carrots all on a bed of rice noodles with Tahini sauce. Finish with tea or espresso and desert of the day. This is not your run of the mill burger! We start with organic ground beef, stuff the patties with diced onions and poblano peppers, sprinkle them with special seasoning and grill it to perfection. Comes with seasonal vegetables and grilled potatoes or rice. Finish with tea or espresso and desert of the day.